Neal and Ava have constructed a dedicated space on their farm for storing and marketing freezer beef to individuals and eventually restaurants. 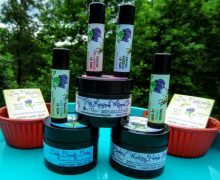 The farm has a long history since Neal’s father started the dairy when he returned from War World II. After the 130-head dairy closed in 1995, the operation switched to beef cattle. Neal’s father, now at the age of 90, still farms when he feels up to it and lends his wisdom. Neal and Ava’s sons also work on the farm when they are not at work or college, while Neal and Ava depend on the farm for their main source of income. 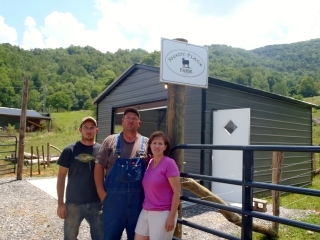 With a 2009 WNC AgOptions grant, they perfected a recipe for homegrown feed, which they produce in an on-farm grinder. Finishing their cattle with their own feed, which they tailor to their customers’ taste preferences, significantly increases their bottom line. Since most of the producers in their area are selling to the local stockyard, Neal and Ava are setting an example of how to add value to an existing cow-calf production by selling a finished product. 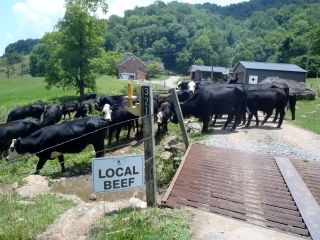 They plan to market their beef through a website, which they are in the midst of creating, as well as at local tailgate markets.